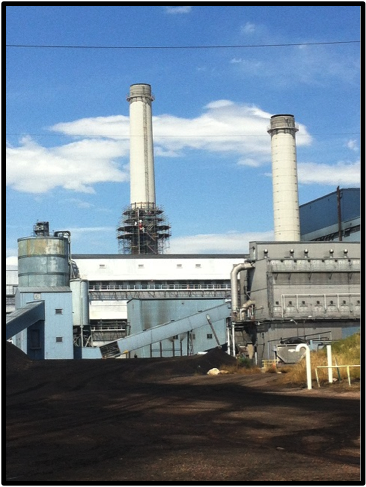 A coal fire power generating facility decided to make design changes to lower emissions. The concrete stack was 200 feet tall and tapered in diameter from a base of 25 feet to 20 feet at the top. The entire stack was coated with semi-rigid protective membrane. The structural repair engineer designed carbon fiber laminates, installed externally, to reinforce the new openings and access equipment. 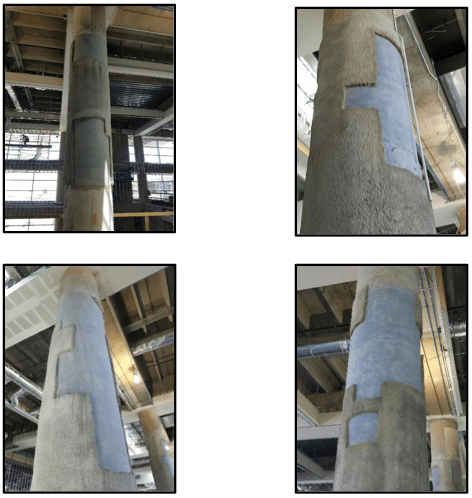 The design of the concrete retrofit required modifications to the stacks, including 4 penetrations that ultimately compromise structural integrity. 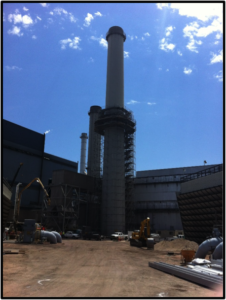 A carbon fiber repair to the stacks restores the structures’ designed architectural performance capability. The structural repair process made use of an existing access platform and exterior elevator which provides ingress from the ground to the platform. 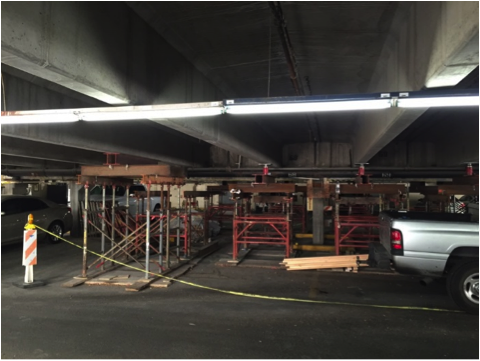 Restruction Corporation assists the engineer with project planning, which includes pricing on retrofitting the concrete structure. We visit the sites pre-construction to evaluate structural conditions and propose a valued engineered solution. A recommendation to replace carbon laminates with wet layup carbon fiber reinforced polymer (CFRP) system. The carbon fiber strengthening system offers more flexible application compared to pre-cured laminate. 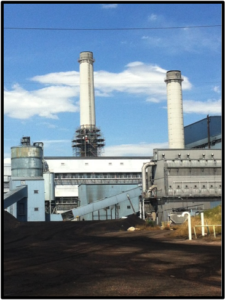 The laminate’s pre-cast shape makes it difficult to adhere to the concrete stacks curvature. The proposed wet layup carbon fiber solution meets design criteria with lower installation material and labor costs while also simplifying the application process. This application is made without compromising the stack’s original design intent. The owner accepted the proposed solution in the form of a contract offer. The scope involved submitting design and calculations, providing access to the site, and removing the existing coating, layout, installation and coating of new carbon fiber and coating. 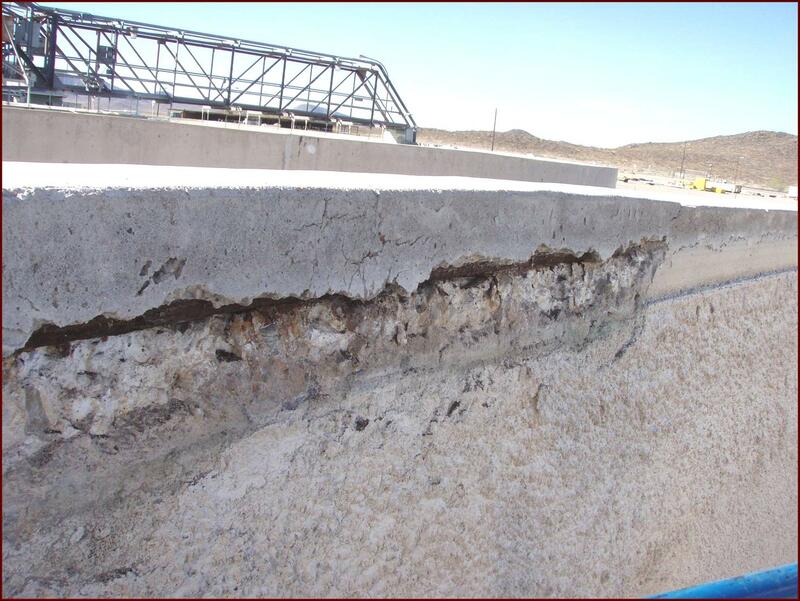 To demonstrate the effectiveness of the CFRP system in-situ bond strength tests are administered to the prepared concrete substrate coating and to the new CFRP coating. For the CFRP bond to the concrete ASTM 4541 is used, and for the coating bond strength both ASTM D903 Peel Test and ASTM D 3359 Tape Test demonstrates bond strength. The coating to coating proof-test allows the existing laminate to stay in place where it was to be re-coated in the areas except where carbon fiber is applied. Once the materials were proven to meet safety and design standards, the installation process began. Our final proofing method of the adhered fiber is to install sacrificial CFRP test panels. 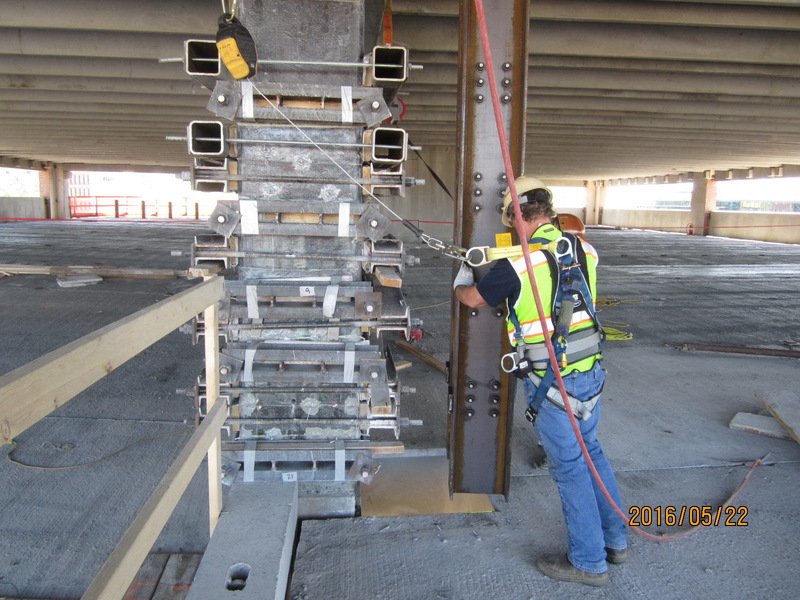 These sacrificial panels are put in place adjacent to the designed installation for bond strength testing and to mark the progress of adhesion quality for each individual installation. Additionally, 2 sample panels are constructed and provided to the owner for material testing per ASTM 3039 for each day of installation. All bond strength and material testing met or exceeded the specifications. 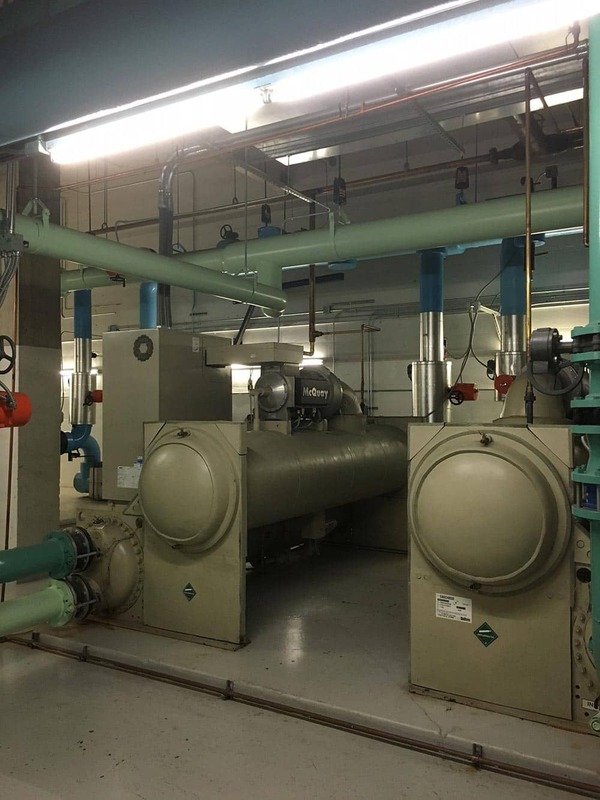 The proof testing of the CFRP and coating materials in the field demonstrated to the owner and engineer that the value engineered solution would meet the design intent of the project and allowed us to complete the project on schedule at lower cost than the originally specified system.